Listening to Embryonic, I can't help but think it was meant to be experienced in a format other than CD. Vinyl, maybe: spread out over two or three records. Or perhaps on cassette, giving it an A side and a B side. Or maybe its songs were meant to be beamed directly into your brain and arranged to match your mood, care of some device to be invented decades from now. Of course, this is the same band that released Zaireeka, a four-disc curiosity intended to be consumed simultaneously. (In other words, you'd need four different stereos.) Unlike The Soft Bulletin (1999), which came two years after Zaireeka, and unlike Yoshimi Battles the Pink Robots (2002) or At War With the Mystics (2006), Embryonic scales back the pop melodies and indulges in atmosphere. This atmosphere vacillates from frenetic and clattering ("Aquarius Sabotage," "Scorpio Sword") to peaceful and drifting ("The Impulse"). "Gemini Syringes" is trance-inducing space rock: As German mathematician Thorsten Wörmann deliberates on an equation, the slow throb of Michael Ivins' bass sways us into a haze. And there's an intermittent clacking, too. It sounds reptilian (but is later revealed to be ... Karen O[!]). In quiet ballads "Evil" and "If," which could be parts I & II of the same song, Wayne Coyne and Steven Drozd examine the good-vs.-evil duality of human nature. They show considerable sensitivity in these, Coyne wanting in the former to spare someone pain, and in the latter Drozd weighing which human motivation is stronger. Bad news: They conclude it's evil, although they do preface that by implying we have more than a small choice in the matter. Drozd sings, "They can be gentle, too / if they decide." In that spirit, Coyne and Karen O collaborate, almost flirtatiously, on "I Can Be a Frog," with her providing imitations of whatever animal he mentions. There are moments when the two nearly break out in laughter, but Coyne's sincerity sells it. You can bet that even as he throws O a loop, like tossing in "helicopter" before "wolf," he has the underlying message in mind, which is that the woman in the song can be anything she wants to be. (Perhaps coincidentally, O did the soundtrack for the 2009 big-screen adaptation of "Where the Wild Things Are.") It's remarkable how tickled and carefree she is here, given how cold she can come across in her Yeah Yeah Yeahs material. With another cameo --- this one an uncredited David Bowie (or if not, an amazing likeness) --- Coyne picks up the thread of good and evil and loops it around the stargazing theme. After Bowie/pseudo-Bowie counts up to 10 (signifying blast-off? ), he gives voice to the dark side ("Free to eat the fruit / from the evil tree"). Also, it seems that those sticky-palmed heathens grant their bodies and/or their souls to "the silver machine" in exchange. Planets and stars, whether astronomy or astrology in nature, fit the Lips' proclivities; after all, they did spend the better part of the past decade working on their eccentric sci-fi venture, the film "Christmas to Mars." Yet there's a Pink Floyd-esque vastness about Embryonic. Wonder how it would sync up to "The Wizard of Oz." Or would "2001: A Space Odyssey" be more appropriate? Heh. 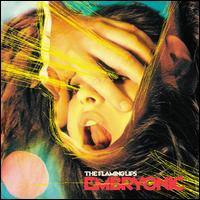 So I finally get around to reading Spin's Flaming Lips cover story, and this is in it: "Embryonic was planned as a double album, with half dedicated to the sort of expansive, hooky tunes that filled the last three albums and half reserved for noisy, experimental weirdness. But they began working on the noisy, experimental weirdness and simply never went back to the hooks. 'We weren't going to worry about writing songs,' says Drozd. ' It was definitely a conscious decision not to do another glistening pop record.'"